Could China Be Trying To Play God With The Weather? China is building a powerful radar system in the South China Sea that critics say could knock out communication systems, manipulate weather systems and even cause natural disasters. The system, which sounds like something out of science fiction, uses pulsed energy beams to study and manipulate electrically charged particles in the high atmosphere. It has civilian and military applications and could challenge US dominance in both spheres. The US military has already been working on similar geoengineering technology, but it has proved controversial with critics warning that it could allow governments to play God by causing disasters such as hurricanes, typhoons and tsunami. Most scientists have dismissed these warnings as alarmist, however, and questioned whether the technology is really capable of doing this. But while the American program – funded by the air force, navy and universities – faces an uncertain future due to budget cuts, China is ready to speed up its own work in this field. The South China Morning Post has learned that Beijing is ready to start work building a powerful machine in Sanya, a resort on the island province of Hainan. The device, known as a High-powered Incoherent Scatter Radar, would be capable of influencing the ebb and flow of subatomic particles as far away as Singapore, a distance of over 2,000km (1,200 miles). This facility would be the most powerful radar in the South China Sea and – regardless of whether it can be used to generate extreme climate events – would have multiple military uses, including improving China’s submarine warfare capabilities and disrupting other countries’ communications networks by creating an atmospheric “black hole”. A Chinese Academy of Sciences official who visited the site in March expressed satisfaction with the progress of the project, according to information on the academy’s website. During his visit, Li Shushen, vice-president at the academy, urged scientists to use the facility to serve China’s “strategic needs” and pursue “frontier issues” in space. The machine works by generating rapid pulses of electromagnetic energy and beams them into the ionosphere, a layer of the atmosphere that can reflect radio waves thanks to a high concentration of ions and electrons. By analysing the radio waves bouncing back off the particles, researchers can precisely measure the disturbance in the ionosphere caused by cosmic activity such as the sun’s rays. The data can also be used to correct the radar images collected by spy satellites to gather more information and focus more precisely on a specific target. By fine-tuning the high-energy beam, scientists could also stimulate the lower ionosphere to generate low-frequency waves and send these back to Earth. These waves can travel long distances through seawater and reach submarines in the deep ocean, which means the technology could be used to send instructions to the subs from the base without the need for them to approach the surface to receive them. At present the US is still the leader in this field of science. It built a similar programme to study and manipulate the ionosphere in Gakona, Alaska about 10 years ago. The main purpose of the High Frequency Active Auroral Research Program, or HAARP, was to improve satellite performance and submarine communication, according to scientists funded by the US navy and air force. But building such a device was technically challenging and the power consumed by the project resulted in mounting costs. So far, only about 10 such instruments have been built, mostly by the US, former Soviet states and the European Union, in strategic coastal areas such as the Atlantic, Pacific and Arctic. The largest devices can generate and beam extremely low-frequency waves over large areas. Because they have the power to penetrate water, the earth’s crust and the human skull, some observers have warned that the governments could use the technology to set off storms or earthquakes and even control the brain. One high-profile sceptic about the use of the technology, Alan Robock, a climate scientist at Rutgers University in New Jersey, warned in 2015 that governments could use the new technology as a “super weapon” and warned that the limits of the technology had not yet been explored. However, most mainstream scientists have dismissed such concerns as overtly conspiratorial, arguing that the technology has so far been used to study the weather in space and support certain military operations. They also point out that however powerful the machines are, they do not at present have enough energy to manipulate weather on any sizeable scale or trigger natural disasters. The Sanya High-powered Incoherent Scatter Radar would be the first such device in the South China Sea. This allow researchers to measure the temperature, density and speed of subatomic particles over huge distances and allows them to observe and influence the ionosphere – something a conventional radar cannot do. One such device has been operating in the southwestern Chinese province of Yunnan since 2012, according to research papers by mainland scientists. The device, located in Qujing, is being used to study the ionosphere and detect extremely small targets such as nano satellites and microscopic pieces of debris for military and civilian space projects. A key component of the instrument is a phased array radar panel about the size of a basketball court. The panel consists of individual modules that could be assembled and taken apart, so the facility could be moved from one location to another in a short period of time. The power of its beam would equal several hundred megawatts, the same amount of energy that would power thousands of households in the US. A senior Chinese radar expert at Xidian University in Xian, capital of northwestern Shaanxi province, who previously worked with the People’s Liberation Army Institute of Telecommunication Engineering, confirmed that the project would operate with two separate divisions, one for civilian research and the other for military operations. 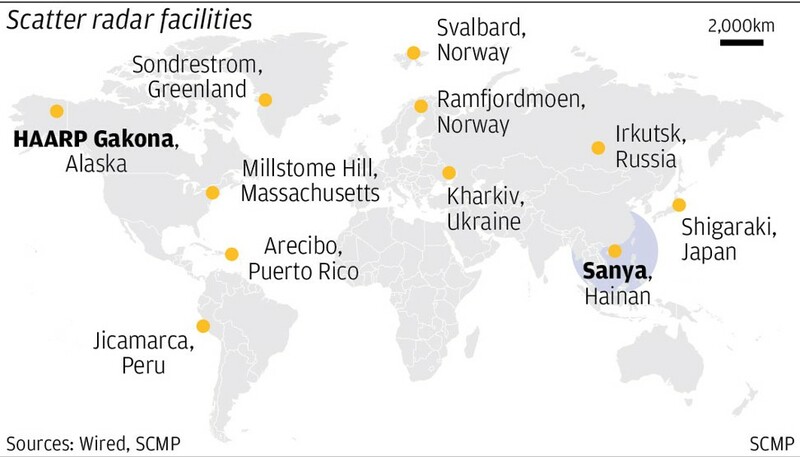 Sanya is China’s main naval base and houses a fleet of nuclear submarines, but the researcher said there were concerns that the island’s power supplies may prove to be inadequate. Shortages have sometimes been reported on the island, which lacks large generating plants. The technology was jointly developed by the Chinese Academy of Sciences, China Electronics Technology Group and Nanchang University, all with close ties to the military. A smaller prototype has been collecting data over the past few years, according to scientists at the site. Zhao Biqiang, a researcher with the Institute of Geology and Geophysics at the Chinese Academy of Sciences in Beijing and a senior scientist involved in the project, said details of the instrument would not be revealed to the public until two or three years later. The Sanya program was officially launched in 2015 with a kick-starting fund of nearly 100 million yuan (US$15.7 million) from the central government. The goal was to develop and build the “world’s most advanced incoherent scatter radar”, according to information on the academy’s website. Zhao declined to comment on the facility’s military applications. “It is too early to talk about what the technology can do. There will be lots of technical challenges and engineering hurdles we may face and have to overcome,” he said. There were other similar facilities under construction in China with a power output “much larger than ours”, Zhao said. The project was led by professor Wan Weixing, an award-winning researcher involved in many defence projects on the ionosphere. 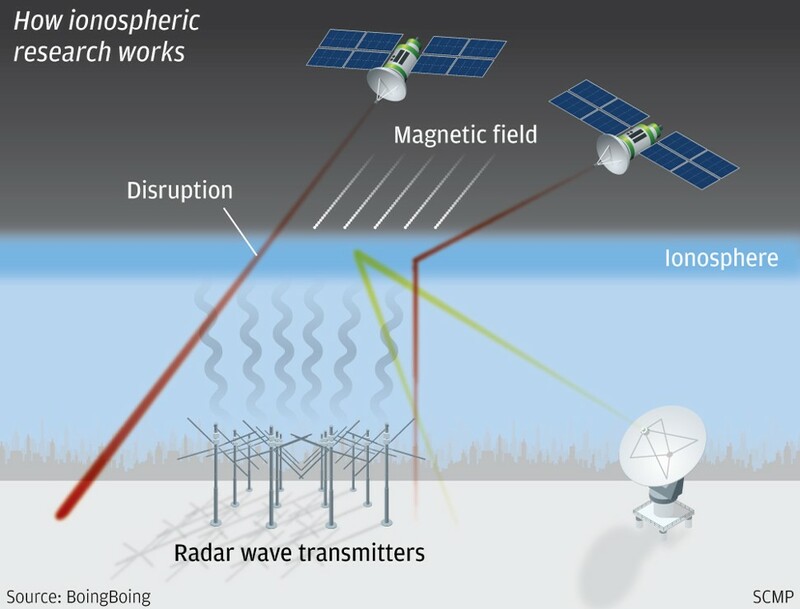 In a research paper published in a domestic journal in 2014, Wan mentioned an experiment conducted by Chinese scientists to heat up a large area in the ionosphere with powerful radar waves. Computer simulation suggested the technology could change the temperature and density of electrically charged particles over an area the size of a large city, according to the paper. Wan could not be reached for comment on the Sanya project. The People’s Liberation Army has funded a large number of research works on ionosphere weapons. They included an airborne device to release a large amount of chemicals in the high atmosphere to create a communication “black hole” over enemy forces. In this case the chemical will change the ionosphere to block radio waves. They could also be designed to allow certain signals, such as extremely low frequency waves generated by a satellite, to pass through the ionosphere and communicate with submarines. There are more immediate safety concerns about the deployment of the powerful electromagnetic instrument in Hainan, a popular tourism destination known as China’s Hawaii. Liu Wenlong, a professor of physics at the school of space and environment at Beihang University in Beijing said the energy beam of ground-based radar could hit passing planes and the area has high levels of air traffic. Although he said he did not think it would be able to penetrate the plane’s multiple layers of protection and burn out its chips – because that would require more energy than existing technology could produce – it needed “careful investigation” to check that the man-made pulses will not affect the plane’s ability to communicate with air traffic control. However, the Xidian University researcher said the facility was likely to have a separate radar to warn passing planes and a facility to shut down operations if planes accidentally came within range.